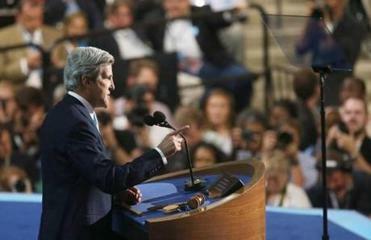 Senator John Kerry of Massachusetts spoke about foreign policy at the convention. 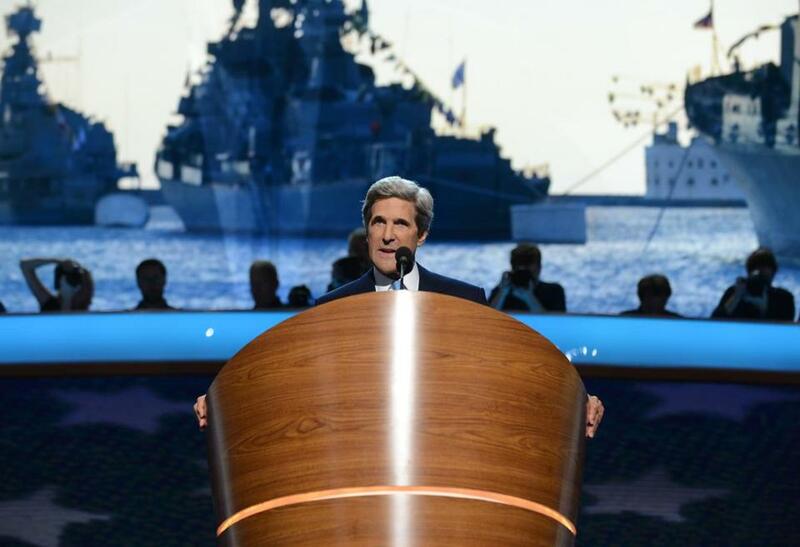 The following is a copy of a speech, as prepared for delivery, by US Senator John Kerry of Massachusetts, at the Democratic National Convention on Thursday, September 6, 2012. In this campaign, we have a fundamental choice. Will we protect our country and our allies, advance our interests and ideals, do battle where we must and make peace where we can? Or will we entrust our place in the world to someone who just hasn’t learned the lessons of the last decade? We’ve all learned Mitt Romney doesn’t know much about foreign policy. But he has all these ‘‘neocon advisors’’ who know all the wrong things about foreign policy. He would rely on them - after all, he’s the great outsourcer. But I say to you: This is not the time to outsource the job of commander in chief. Our opponents like to talk about ‘‘American exceptionalism,’’ but all they do is talk. They forget that we are exceptional not because we say we are, but because we do exceptional things. We break out of the Great Depression, win two world wars, save lives fighting AIDS, pull people out of poverty, defend freedom, go to the moon - and produce exceptional people who even give their lives for civil rights and human rights. Despite what you heard in Tampa, an exceptional country does care about the rise of the oceans and the future of the planet. That is a responsibility from the Scriptures - and that too is a responsibility of the leader of the free world. The only thing exceptional about today’s Republicans is that - almost without exception - they oppose everything that has made America exceptional in the first place. An exceptional nation demands the leadership of an exceptional president. And, my fellow Americans, that president is Barack Obama. Just measure the disarray and disaster he inherited. A war of choice in Iraq had become a war without end, and a war of necessity in Afghanistan had become a war of neglect. Our alliances were shredded. The Massachusetts senator hammered Mitt Romney as “extreme” on foreign policy in his speech at the Democratic National Convention. Our moral authority was in tatters. America was isolated in the world. Our military was stretched to the breaking point. Iran was marching unchecked towards a nuclear weapon. And Osama bin Laden was still plotting. It took President Obama to make America lead like America again. It took President Obama to restore our moral authority - and to ban torture. This president understands that our values do not limit our power - they magnify it. He showed that global leadership is a strategic imperative for America, not a favor we do for other countries. And President Obama kept his promises. He promised to end the war in Iraq - and he has - and our heroes have come home. He promised to end the war in Afghanistan responsibly - and he is - and our heroes there are coming home. He promised to focus like a laser on al - Qaeda - and he has - our forces have eliminated more of its leadership in the last three years than in all the eight years that came before. And after more than ten years without justice for thousands of Americans murdered on 9/11, after Mitt Romney said it would be ‘‘naive’’ to go into Pakistan to pursue the terrorists, it took President Obama, against the advice of many, to give that order to finally rid this earth of Osama bin Laden. Ask Osama bin Laden if he is better off now than he was four years ago. Barack Obama promised always to stand with Israel to tighten sanctions on Iran - and take nothing off the table. Again and again, the other side has lied about where this president stands and what this president has done. But Prime Minister Netanyahu set the record straight - he said, our two countries have ‘‘exactly the same policy.” - ”our security cooperation is unprecedented...’’ When it comes to Israel, I’ll take the word of Israel’s prime minister over Mitt Romney any day. President Obama promised to work with Russia to reduce the threat of nuclear weapons and signed an historic treaty that does just that. He promised to lock down nuclear materials around the world, and he has done just that. He refused to accept the false choice between force without diplomacy or diplomacy without force. When a brutal dictator promised to kill his own people ‘‘like rats,’’ President Obama enlisted our allies, built the coalition and shared the burden, so that today - without a single American casualty - Moammar Gadhafi is gone and the people of Libya are free. So on one side of this campaign, we have a president who has made America lead like America again. What is there on the other side? An extreme and expedient candidate, who lacks the judgment and vision so vital in the Oval Office. The most inexperienced foreign policy twosome to run for president and vice president in decades. It isn’t fair to say Mitt Romney doesn’t have a position on Afghanistan. He has every position. He was against setting a date for withdrawal - then he said it was right - and then he left the impression that maybe it was wrong to leave this soon. He said it was ‘‘tragic’’ to leave Iraq, and then he said it was fine. He said we should’ve intervened in Libya sooner. Then he ran down a hallway to duck reporters’ questions. Then he said the intervention was too aggressive. Then he said the world was a ‘‘better place’’ because the intervention succeeded. Talk about being for it before you were against it! Mr. Romney - here’s a little advice: Before you debate Barack Obama on foreign policy, you better finish the debate with yourself! ‘‘President Mitt Romney” - three hypothetical words that mystified and alienated our allies this summer. For Mitt Romney, an overseas trip is what you call it when you trip all over yourself overseas. It wasn’t a goodwill mission - it was a blooper reel. But a Romney - Ryan foreign policy would be anything but funny. Every president of both parties for 60 years has worked for nuclear arms control - but not Mitt Romney. Republican secretaries of state from Kissinger to Baker, Powell to Rice, President Bush, and 71 United States senators all supported President Obama’s New Start treaty. But not Mitt Romney. He’s even blurted out the preposterous notion that Russia is our ‘‘number one geopolitical foe.’’ Folks: Sarah Palin said she could see Russia from Alaska; Mitt Romney talks like he’s only seen Russia by watching Rocky IV. So here’s the choice in 2012. Mitt Romney: out of touch at home, out of his depth abroad and out of the mainstream. Or Barack Obama: a president who is giving new life and truth to America’s indispensable role in the world; a commander - in - chief who gives our troops the tools and training they need in war, the honor and help they’ve earned when they come home; a man who will never ask other men and women to fight a war without a plan to win the peace. And let me say something else. No nominee for president should ever fail in the midst of a war to pay tribute to our troops overseas in his acceptance speech. Mitt Romney was talking about America. They are on the front lines every day defending America, and they deserve our thanks. Some of us from a prior war remember coming home was not always easy. President Obama has made it his mission that we welcome our troops home with care, and concern, and the respect they deserve. That is how an exceptional nation says ‘‘thank you’’ to its most exceptional men and women. Mitt Romney says he ‘‘believes in America’’ and he’ll restore ‘‘American exceptionalism.’’ I have news for him: We already have an exceptional American as president - and we believe in Barack Obama!